Seth was my first fainter buck. I went to upper MN to buy a vaccine and ended up buying him as well. He rode home in the back of my Chevy Corsica and brought many smiles to the people who saw him in the car, while we were stuck in a traffic jam. But Seth was a cool charater, simply laid on the back seat and peeked out the window. He was what really got me started into fainting goats. I loved his coloring, and his easy going temperment. 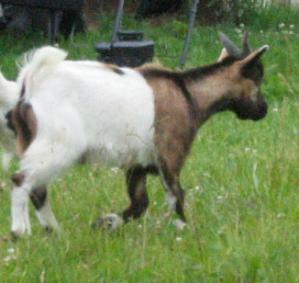 Unfortantely I had to sell him when I moved, as I had to downsize on a lot of my goats. But I have several of his daughters, Star, S'mores, & Mayla. Jasmine, Nestle, & Ruby were out of Seth as well and I sold them when I had to downsize. Seth's dam is a pastel tri-color with markings like a gazelle, and his sire (also named Seth) is a brown & white with huge sweeping horns. All of Seth's daughters have had kids and he has stayed in my herd through them! Daugthers: Star, Smore, Mayla, Jasmine, Hedi, ect.